A biodegradable non-alkaline formula with deep penetration action. Helps to relax tired, aching muscles and helps to itching, biting and scratching. Thera-Care is a unique natural dip, also helps to relieve multiple skin problems. Contains Tea Tree Oil, Herb and Citrus Oils. Alternative to Pesticides. DO NOT USE ON CATS. - Neutralizes Animal Odor-Even Skunk! 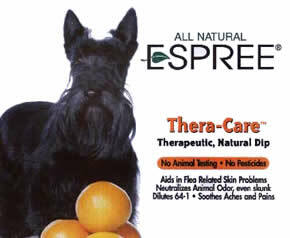 Espree uses 100% Certified Organic Aloe Vera in every product. Below is a summary of the benefits of Aloe Vera. The Aloe Vera plant is possibly one of the most studied herbs in the "Natural" and "Organic" product industry and has over 400 species, each containing over 200 biologically active, naturally occurring constituents. Aloe Vera absorbs moisture from its surroundings to provide excellent hydration and enhances dermal moisture without the pore-clogging residue of oils. Aloe Vera is a succulent plant member of the Lily family. Organically grown Aloe Vera is rich in polysaccharides and minerals such as Potassium (which exhibits a positive charge upon intracellular fluids of the body), Calcium (activates a series of enzymes that are essential in the fat and carbohydrate metabolism of the body). Aloe Vera is as rich in Calcium as Spinach, Sulfur (essential for the sulfur containing amino acids present in the body and in the blood) Magnesium (important for bone formation and carbohydrate metabolism). Other minerals include iron, sodium and copper, which promote the maturation of red blood cells. 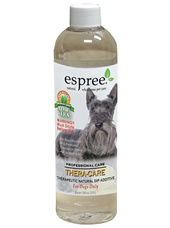 The moisturizing, healing and soothing properties of Aloe Vera will help guard against irritation, rash and dryness of not only our four legged family friends, but will also help protect the groomer from "bathers rash" due to the drying effects of multiple baths, and replenish the skins lost moisture.